Takara Tomy Arts have recently announced the upcoming release of the Zelda figure collection. 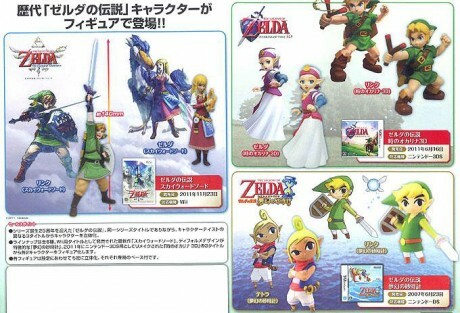 The collection of six pvc figurines will include Link and Zelda from Skyward Sword, Young Link and Young Zelda from Ocarina of Time, and Link and Tetra from Wind Waker. Each figurine is packed in a plastic capsule meant for distribution from a gashapon dispenser. However NCSX will be selling them as a set for $28.90. Shipments of the figures are set to arrive in late April 2012. Jump inside to see the announcement. 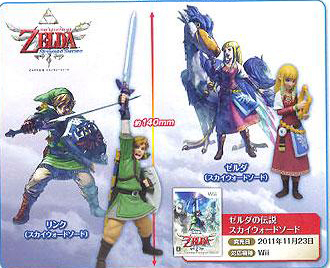 » The Legend of Zelda: Skyward Sword– Link and ZeldaEach figure is packed in a plastic capsule and the toys are normally sold in gashapon dispensers where the luck of the draw decides which figure you’ll receive when the dispenser knob is turned. For the sake of completion, NCS will gather together the six different figures and supply them in complete sets at the price of US$28.90 each. Reservations are welcome to ship in mid-late April 2012. I was wondering when we were finally going to see some Skyward Sword related figurines. I recall a couple mentions of them back in DEcember but so far have not actually encountered any. Just many more rereleases of Spirit Tracks ones all the time. It is too bad all we are getting are just Link and Zelda. I would have liked to see a pvc Demise. So what do you think? Do you like the figures? Will you be getting these? Let us know in the comments below.